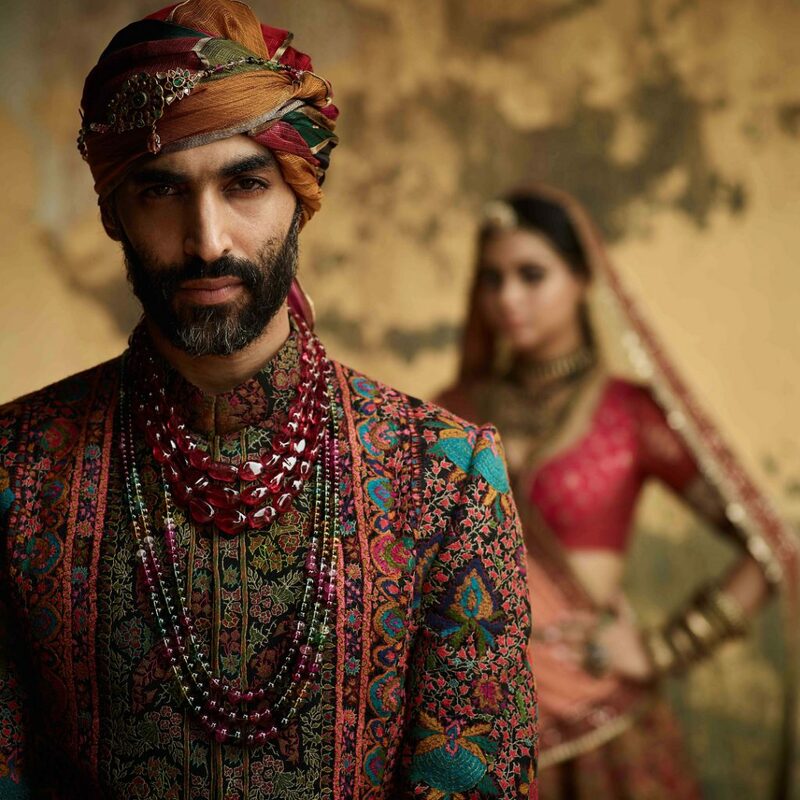 Latest Sabyasachi Collection For Bride & Grooms - Decoded! Getting married soon and haven’t yet checked out the latest Sabyasachi collection for bridal lehengas and wedding jewllery? Hold your breath and get ready to be stunned by the timeless and classy Kesribai Pannalal collection as we decode it piece by piece! He is every brides-to-be’s dream couturier. And every single wedding lehenga from the latest Sabyasachi collection tells a story through its intricate details and karigari. 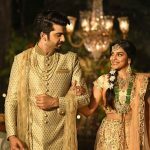 Yes… its time to watch, swoon and fall in love with the stunners from Sabysachi Mukherjee’s 2018 bridal collection! 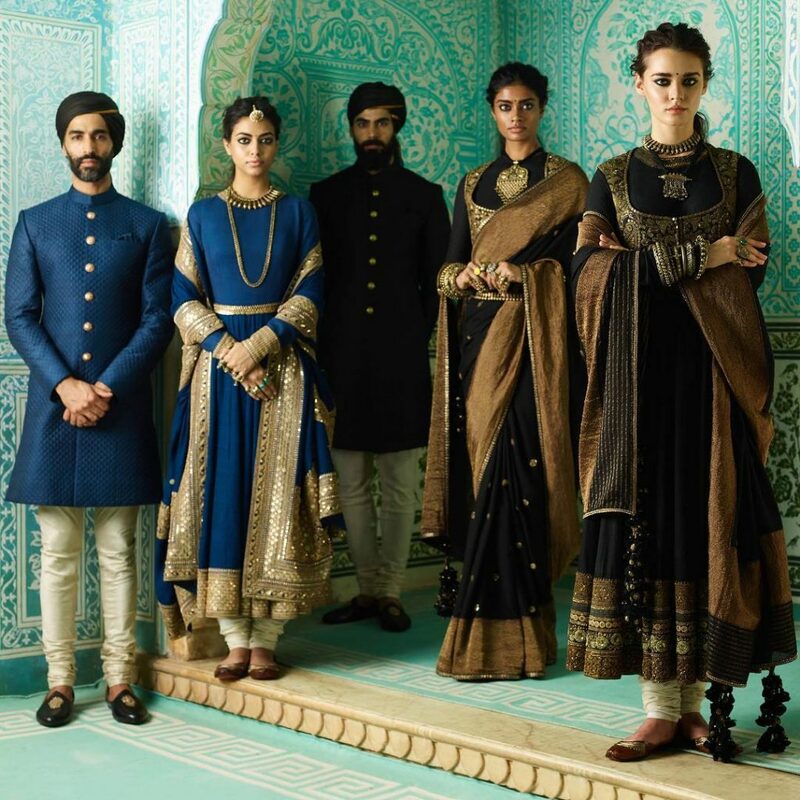 The Latest Sabyasachi Collection – Kesribai Pannalal! 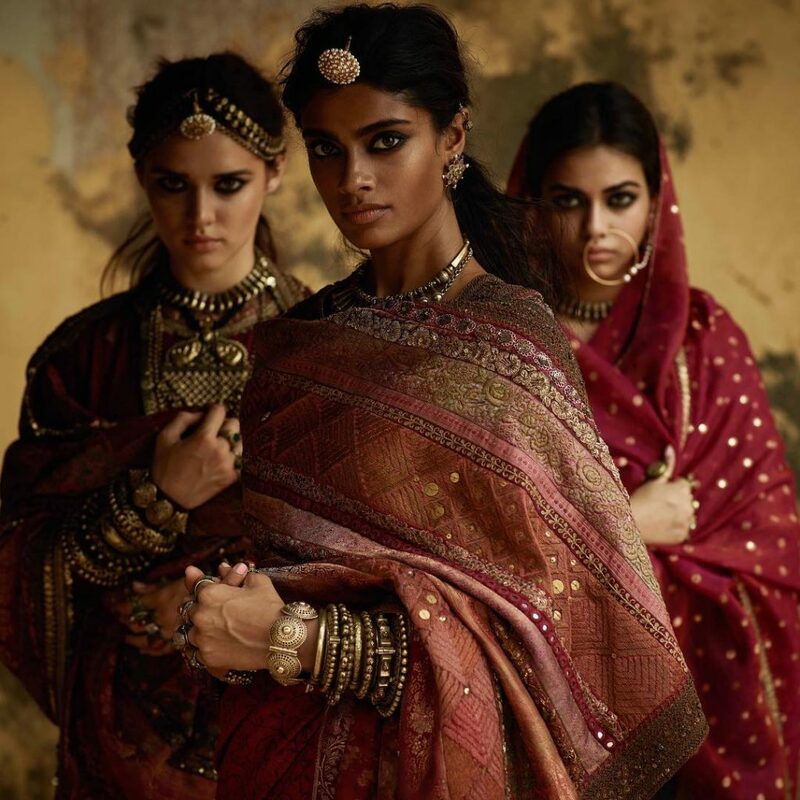 This latest Sabyasachi collection is a testimony of the richness of Indian heritage juxtaposed in modern times, depicted through exclusively hand painted and finely embroidered and stone encrusted lehengas, sarees, anarkalis and drop-dead stunning jewelry. These stunning bridal lehengas are elaborately hand-painted by the artists of the Sabyasachi Art Foundation and intricately embroidered with silk-floss, beaten gold and silver thread, then carefully encrusted with semi-precious stones and pearls. 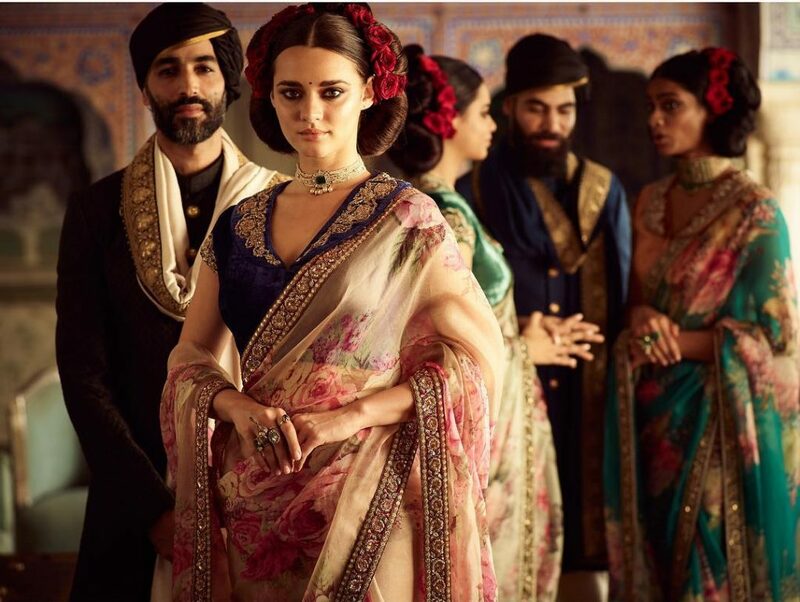 Craftsmanship – The Soul of a Sabyasachi Lehenga! Every ornate ivory silk wedding lehenga in this latest Sabyasachi collection is made in three different stages that take over 5340 hours to finish. First hand-painted, then appliquéd with tea-dyed velvet and then over-layered with zardosi, coffee-stained pearls, rhinestones, crystals and semi-precious stones. 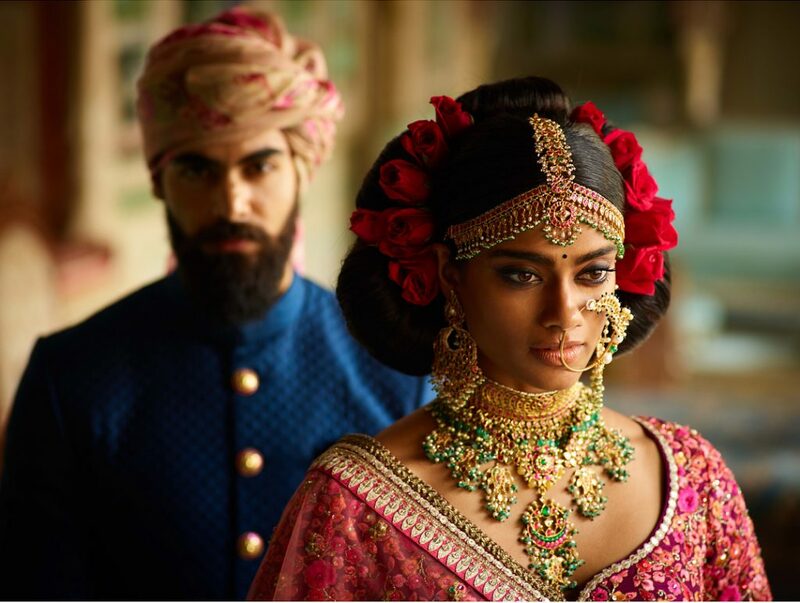 With this collection, Sabyasachi pays an ode to not just the age old intricate jadau and meenakari bridal jewelry that oozes a rich Indian heritage charm but also celebrates the classic traditions in dressing up as a bride with kohl eyes, henna feet, elaborate beauty rituals and earthy grace! These heritage jewellery collection pieces in pure 22K gold, eclectically strung together with rubies, emeralds, tourmalines, pearls, and yellow sapphires are such a beauty, aren’t they! The Iranian turquoise velvet lehenga is a beauty worth dying for! Intricately embroidered with zardosi, appliqué, pearls and crystals it is everything your dream wedding lehenga should be. The eternal lotus jade brocade lehenga is an over powering stunner – encrusted with hand-cut crystals, pearls and burnt silver zardosi. Paired beautifully with period uncut diamond necklace with engraved three-dimensional peacocks in 22k gold and hand-carved ‘lotus’ jhumkas! If you’re looking for a wedding lehenga in deep royal shades with glamorous gold – this rich indigo velvet lehenga is perfect for you. Imagine wearing that lehenga with this stunning bridal necklace in pure 22k gold, encrusted with rubies and emeralds and strung with pearls, and beautifully paired with a heritage tika and chaandbali set. Another beauty is this elegantly embroidered moss green silk lehenga paired to perfection with his lotus jade khadi sherwani with burnt gold zardosi detailing! 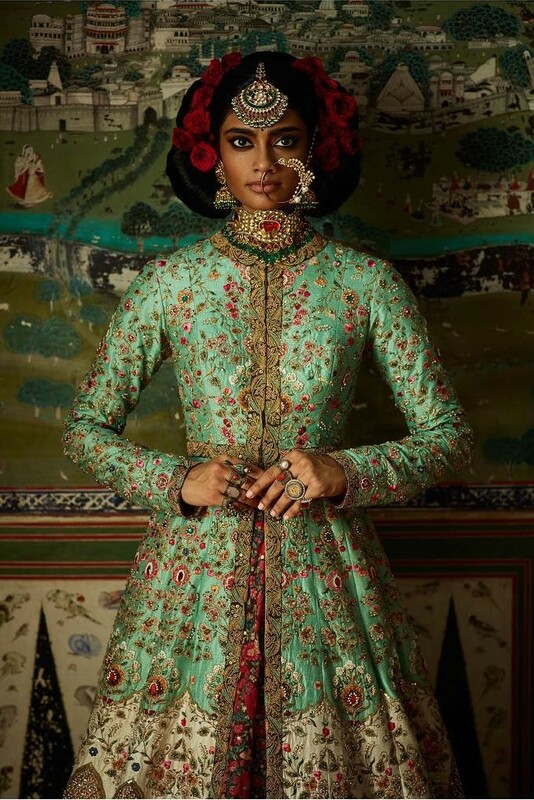 How couture-meets-Bohemian-whimsy is this hand-painted baroque jacket in ivory and Iranian turquoise silk, worn on top of a voluminous cotton lehenga! The stunning Dil-Guldasta Lehenga is a masterpiece in itself! Intricately embroidered on Bordeaux silk with hand-dyed velvet appliques, silk-floss, beaten silver and gold thread and rose-tinted crystals and rhinestones. 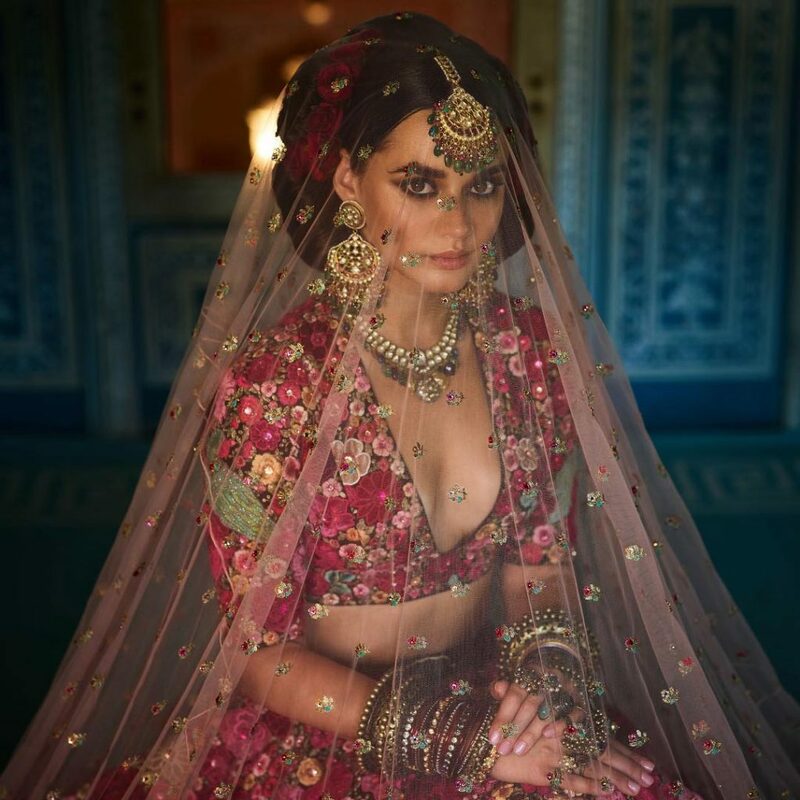 This bridal lehenga is perfectly matched with the Sabyasachi Heritage Jewelry Collection and romanticized with a sheer, diaphanous, embroidered veil. And you can’t ignore the menswear line with classics like this quilted silk sherwani in hand-dyed Murshidabad silk and accessorized with handcrafted Bengal tiger buttons. Paired with printed organza safa – its just what someone on the team groom needs! 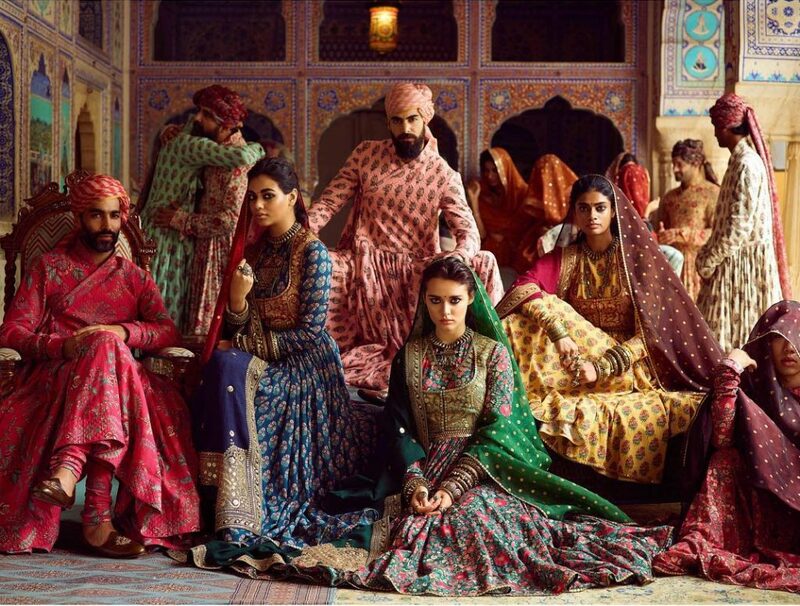 The Taramati Biradari speaks of a myriad of colors that represent a mood of celebration with layers of muslin, prints, vintage embroidery, tilla and badla embellishments. This ‘Sulekha’ blue lehenga hand-embroidered and framed with heritage zardosi borders looks soooo festive with its orange badla dupatta and a woven Benarasi veil. We cannot get over these perfectly paired statement choker and earrings! And if you love everything earthy – you’ll fall in love with these Varanasi organza sarees, with block printed ‘kanthi’ blouses and ‘tilla’ embroidered miniature gilets. These colorful kalidar kurtas with tilla dupattas and benarasi odhnas make the perfect mehendi wear along with the printed angrakhas and floral turban for men! 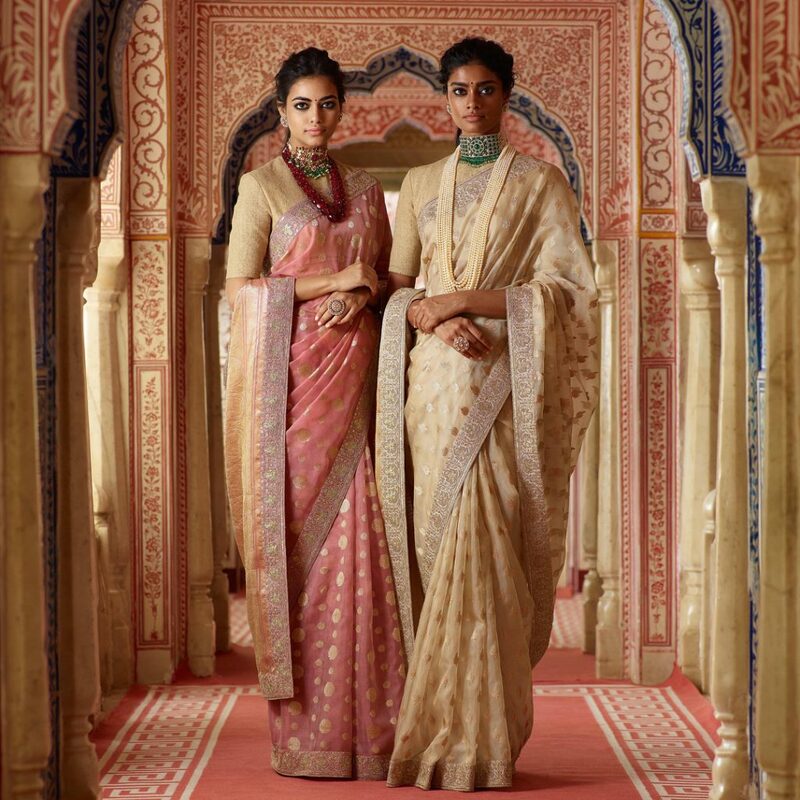 The guftgu range oozes vintage charm – with women wearing shawl-collar velvet portrait blouses with and hand-painted and printed organza sarees with vintage borders. The men are again in quilted silk sherwanis but paired elegantly with rich tussar stoles. Note how these are paired with dainty necklaces made out of emeralds, diamonds, rose-cuts and natural pearls. Looking for something Sabya but more Royal Rajasthan? 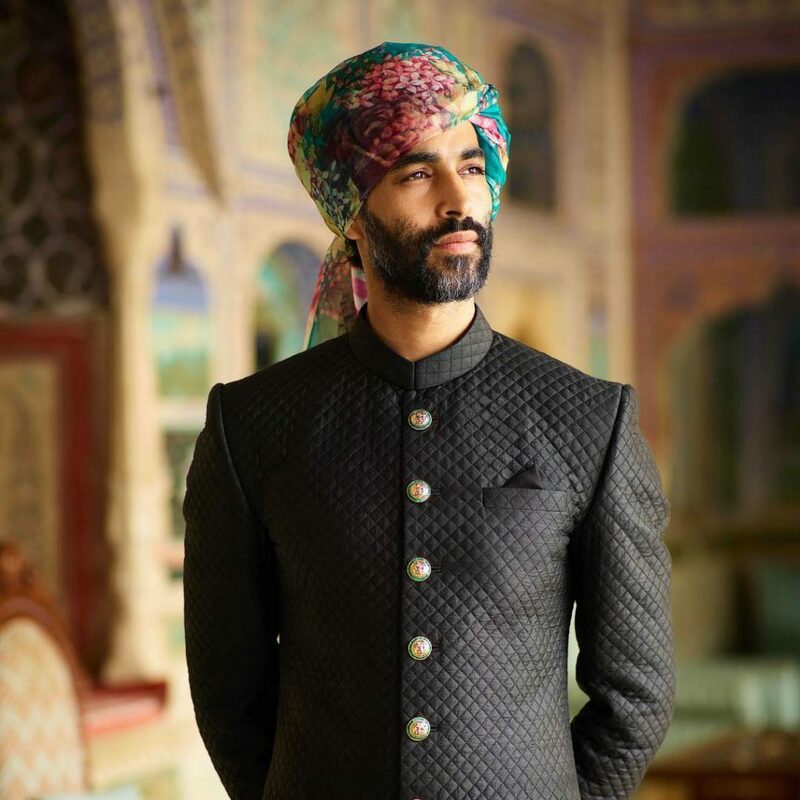 Check out his stunning Udaipur Collection! This is an ode to the classic red bridal sarees and lehengas which are usually benarasi or aari-taari sarees with gota or zardosi borders and reflect a rich timeless vibe. 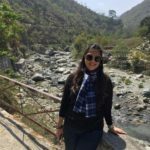 Think of such silk mashru kurtas, with chowki design dupatta and a mashru gharara with ‘tilla’ details – aren’t they ideal for Punjabi or Sikh Anand Karaj ceremonies! 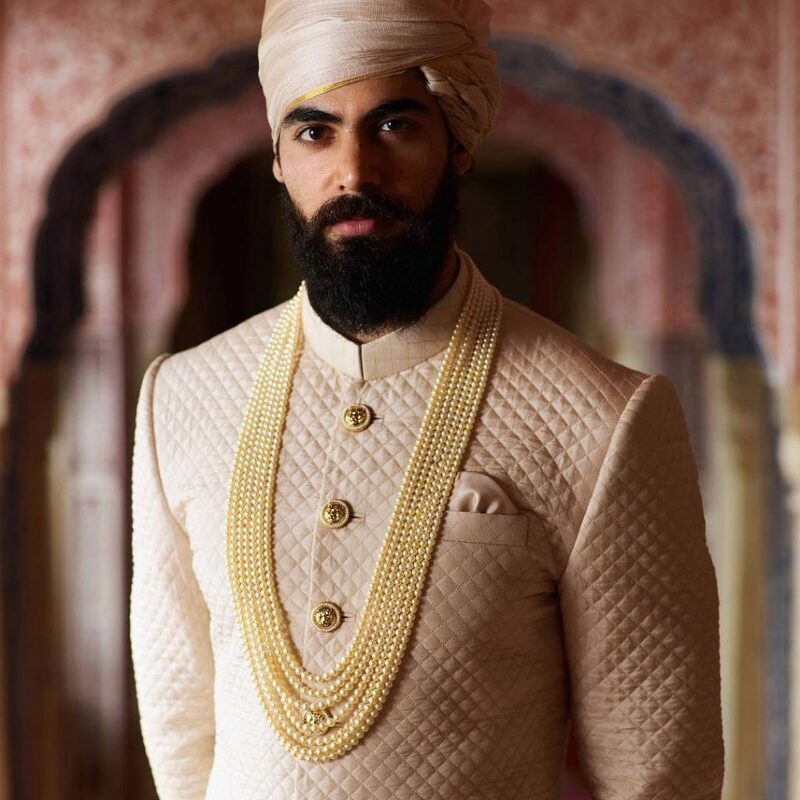 This menswear in this line subtly contrasts and complements in shades of ivory – continuing the classic quilted silk sherwani look with handcrafted Bengal tiger buttons. The Shwetkamal line oozes regal timeless charm through luxurious handwoven organic silk blouses and Benarasi organza sarees with ‘tilla’-border details that look nothing less than regal! Come winter and this luxurious velvet sari in ivory with an embroidered Kashmiri shawl style ‘tilla’ work pallu and delicate tulle pleats is stunningly perfect! Inspired by Mughal miniatures and Benarasi meena, this lavish lehenga is framed with a museum-quality zardosi border featuring elephants and foliage with three-dimensional relief. Another beauty is this lotus-pink ‘tota-mynah’ lehenga framed an intricate border. The Neelkamal line presents a powerful vision in stark hues of black and indigo completed with kohl rimmed eyes and chunky tribal jewelry for a statement look. This unique black silk matka gheredar kurta with antique zardosi details and a spectacular ‘tilla’ work miniature gilet is simply wow! 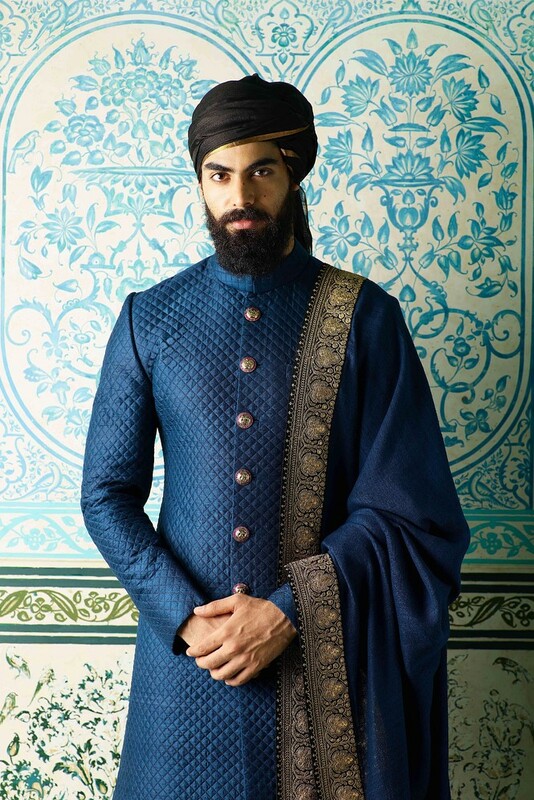 For a groom who loves his blues, what’s more classy than this indigo hued quilted silk sherwani in hand-dyed Murshidabad silk and accessorized with hand-crafted Bengal tiger buttons. Paired with beautiful tussar georgette shawls with antique ‘tilla’ borders in burnt gold for the completely royal look. This severe indigo blouse with zardosi neckline detail is worn with an indigo blue matka saree with hand-embroidered ‘tilla’ borders and is ideal to wear to any wedding reception. 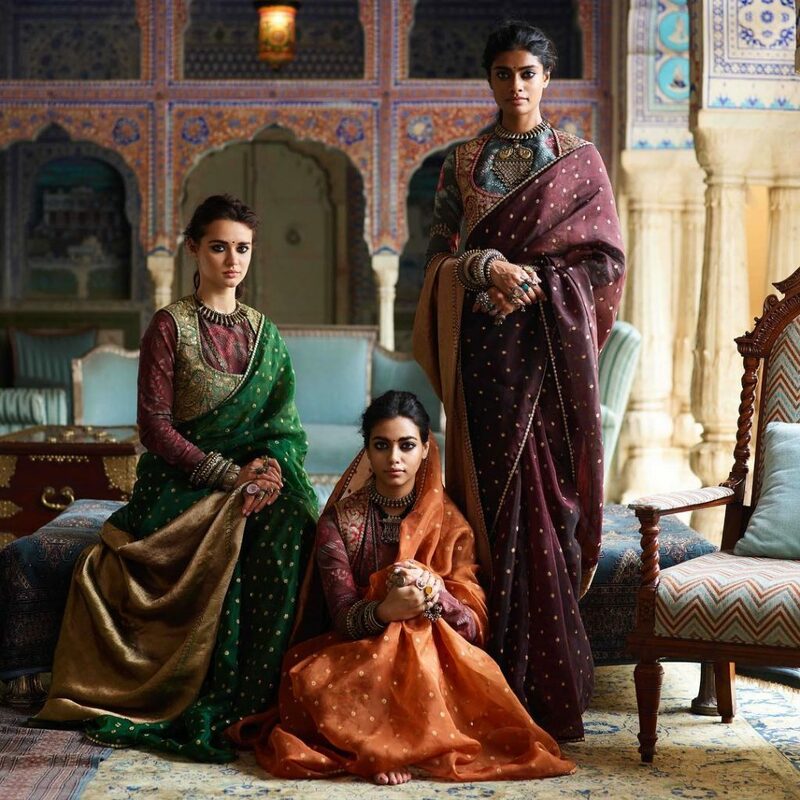 Pashmina Collectibles from the Latest Sabyasachi Collection! This Pashmina lehenga is a modern heritage beauty created for this winter’s brides! Antique shawls from the Sabyasachi textile archives have been deconstructed and reconstructed and framed with a patchwork of multiple zardosi borders. Finally paired with a patchwork zardosi and kantha blouse, a museum quality Benarasi dupatta and a Benarasi organza odhna. On similar lines, the Pashmina Sherwani is perfect for this winter’s grooms and can be paired with hand-printed silk kota safas. 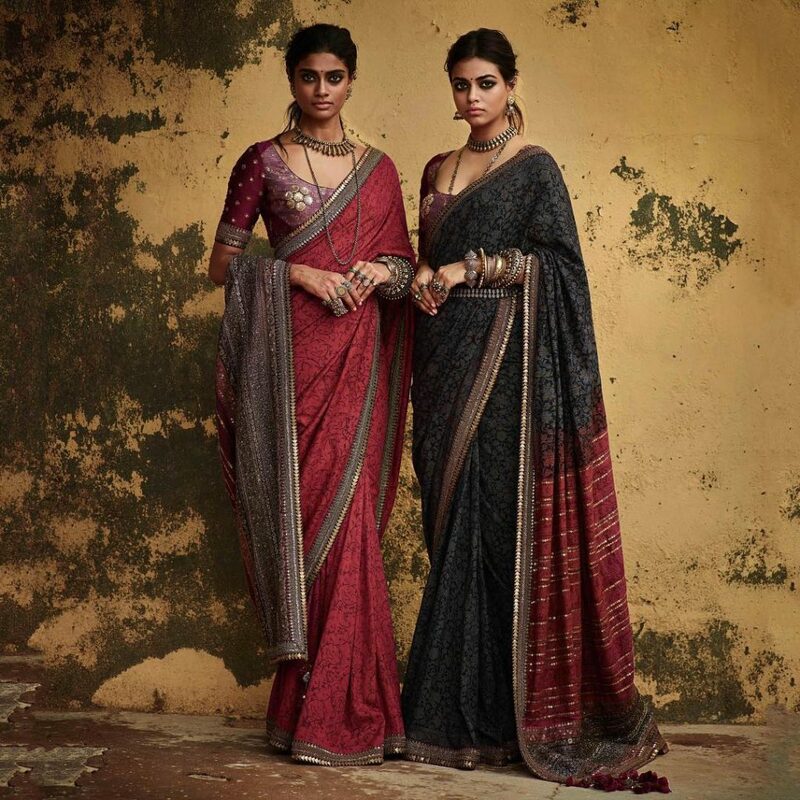 These meticulously textured and overdyed Kalamkari sarees from Andhra Pradesh are intricately textured and then embellished with Sabyasachi’s signature aged zardosi borders; and given a stunning pallu crafted out of a melange of heritage borders. 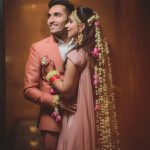 Don’t we love the melange of textiles, embroidery, prints and dyes that create these unique, cross-cultural bridal ensembles! 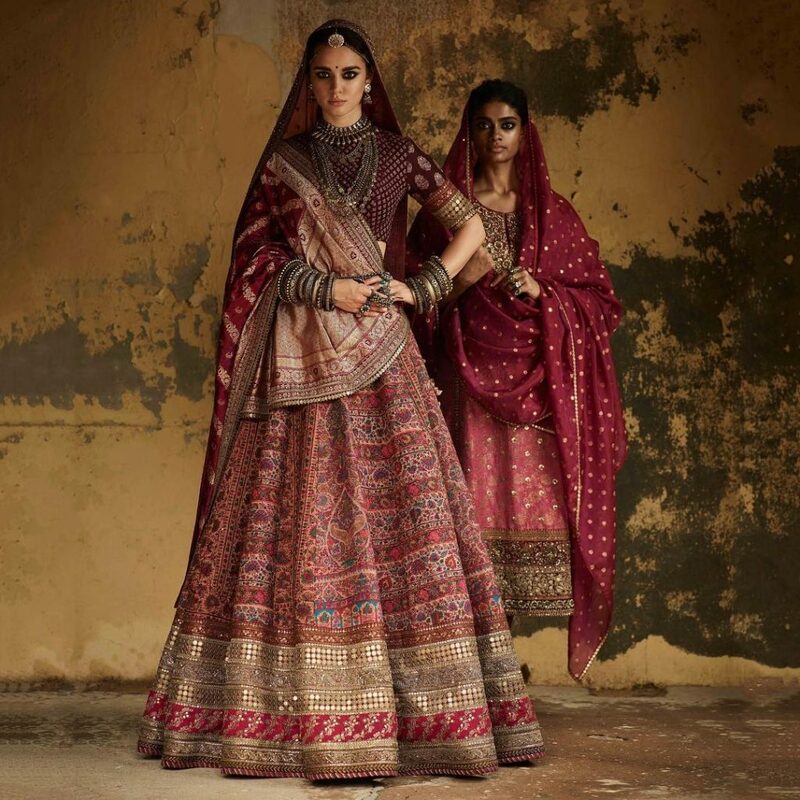 The bold and brilliant pieces from the latest Sabyasachi’s collection of bridal lehengas, sarees and sherwanis can make anyone feel royal on their big day. 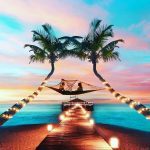 We’re truly speechless and breathless right now and we’re sure this is all the inspirations you need for your wedding trousseau!